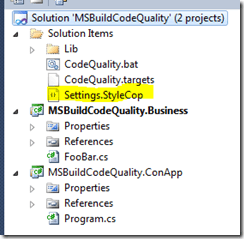 I´ve already blogged about how to use StyleCop in an MSBuild Script. 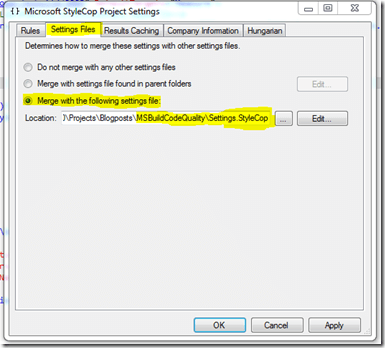 Today I´m going to show you how to create a StyleCop Settings file and apply them in every build with visual studio. Here is an easy solution. As point of origin we take the solution from the last blogpost. The stylecop file is already situated outside of the project. Hint: To create a "default-stylecop" file just install Stylecop and click right on a project and after that click "run stylecop". After that a Settings.Stylecop file will be created into the project directory. To check the code after every building process you need to edit the project file. The StyleCop Target should be added. If you, like in my example, copy all Stylecop files from the installation directory into the solution, it will work for all project members, doesn´t matter if they installed Stylecop or not. I copied the whole folder into the solution directory. The second import statement is responsible for the activation of StyleCop. Also the position is important. After I wrote the import statement into the first line, there was no result visible. After the import of the target file in every project it´s done. It may be helpful to integrate StyleCop into your projects. But depending on the needs of every project you need to decide which rules are helpful. The rules are easy to manage with a central StyleCop file and it will be helpful after initiation of the project / solution because you will be reminded after every build - doesn´t matter from MSBuild or via Visual Studio.